Do you want to eat better, but just don’t know how to get started? Have you been eating a Standard American Diet, but know that real food is what you need to start cultivating health once again? Does all the conflicting info online leave you confused, overwhelmed, and frustrated? Well, let me help! 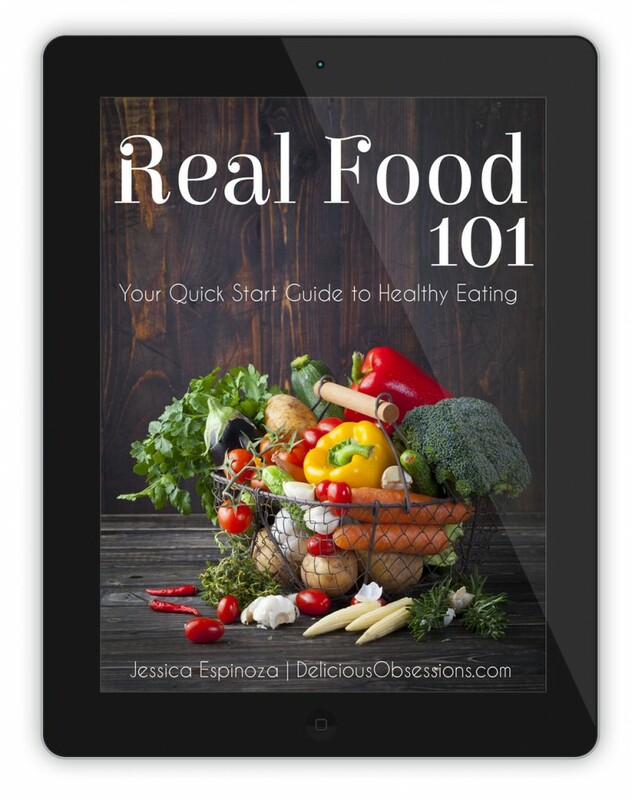 My book, Real Food 101: Your Quick Start Guide for Healthy Eating was designed to help YOU get started with real food, while eliminating the stress and overwhelm. Real Food 101 has grown from my passion for real food and nutrition. I started my site, Delicious Obsessions, in 2010 as a way to share my love of real food and cooking with my family and friends. I loved cooking and was constantly writing down recipes on little scraps of paper, and then subsequently losing those scraps. So, in an effort to be able to organize myself (and give the recipe to family and friends when they asked), I decided a blog might be just the thing. I had no idea the amazing road that would lie ahead of me when I published my first blog post on September 9th, 2010. What an amazing journey it has been. I have learned so much and met so many incredible people. The Internet has given me the ability to share my love of food and nutrition on a much larger scale than I ever dreamed. After starting the blog in 2010, I found a passion for helping people transition from the Standard American Diet (SAD) to a real food, nourishing diet. I enjoyed sharing my own kitchen-tested recipes with others, giving them tips, tricks, and ideas for making healthy substitutions. Ultimately, with the goal to help as many people as possible give up refined, processed foods and cultivate health with nourishing, wholesome food as close to the way it was designed as possible. Since 2010, Delicious Obsessions it has grown into a vibrant community of people looking for the best information on a variety of topics. We now have an amazing team of contributing writers and cover all aspects of health, including real food, natural living, nutrition, health conditions, DIY tutorials, and much more. When we are asked to change something within our lifestyle, we naturally feel some resistance. Sometimes, making these types of changes can be overwhelming and frustrating. Sometimes, it feels like too much work. Sometimes, we have outside pressure and conflict (from family, friends, coworkers, etc.) to deal with as well. All of this can leave you questioning whether these changes are worth it. Well, I can tell you with certainty that yes, eating real food IS worth it. The main goal I have for this book and my website is to provide information that is easy to understand and recipes that are nutritious, easy, and delicious. I am here to show you how you can make small changes that will pay off in a big way. From this eBook, I will link you to hundreds of tried-and-true, kitchen-tested recipes that are all delectable and completely full of real food. Understand why we must nourish our bodies with real food in order to cultivate health. Define what real food is so that you are no longer confused as to what you should and should not be eating. Learn how to select real food in real life shopping situations. Find ways to afford real food, no matter how small your budget may be. Give you tips and tricks for stocking your real food pantry. Offer you recipes, resources, and suggestions for further reading. Ready to Snag Your Copy? Real Food 101: Your Quick Start Guide for Healthy Eating was a labor of love and I can’t wait to get a copy of it into your hands (well, technically computer, but you could print it off you you like!). The core mission of Delicious Obsessions is to help people eat better and live healthier. Real food is at the very heart of this mission. If you’re ready to get started with real food and start feeling better, sign up for my free weekly newsletter and receive instant access to this Real Food 101: Your Quick Start Guide for Healthy Eating. NOTE: The link to the free eBook download will be in the email you receive once you confirm your subscription. If you have any problems, please let me know. Spam Protection: I will never spam you or sell or give away your information. My weekly newsletter will include exclusive content (not published anywhere else), special offers, blog highlights, including new recipes, giveaways, special events, and more. I may, on occasion, send out special announcements if there is something I don’t want you to miss! If you want to make sure you never miss a new post that is published on Delicious Obsessions, you can also subscribe for email updates. I publish a new post on this site 3-4 times per week. Sign up for RSS here.